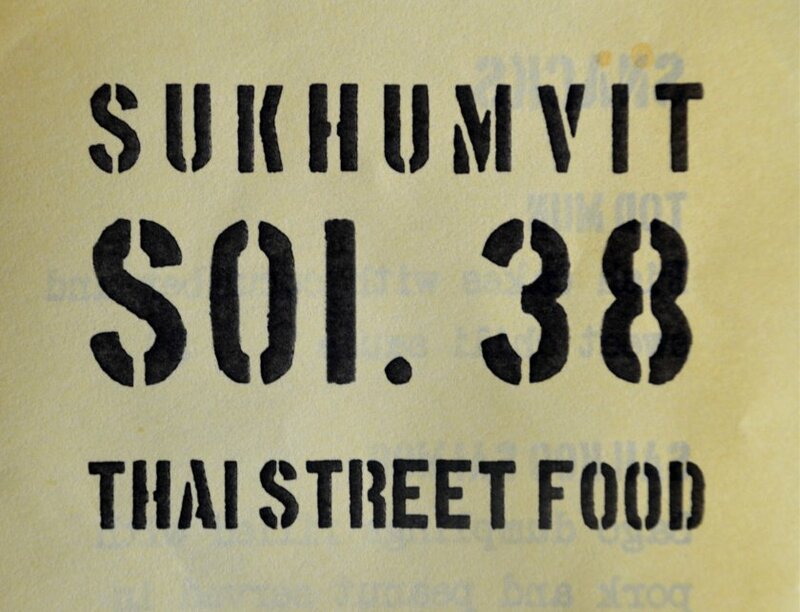 Any foodie that has been to Bangkok would be familiar with Sukhumvit Soi 38. It’s said to be one of the best street food locations in Thailand serving up cheap, tasty and quick meals on notoriously wobbly metal tables. The scene is a little different at the Pulteney Street location with the same name. With over 20 dishes to choose from, customers get the opportunity to sample some of Thailand’s street food delicacies without having to fly over there. 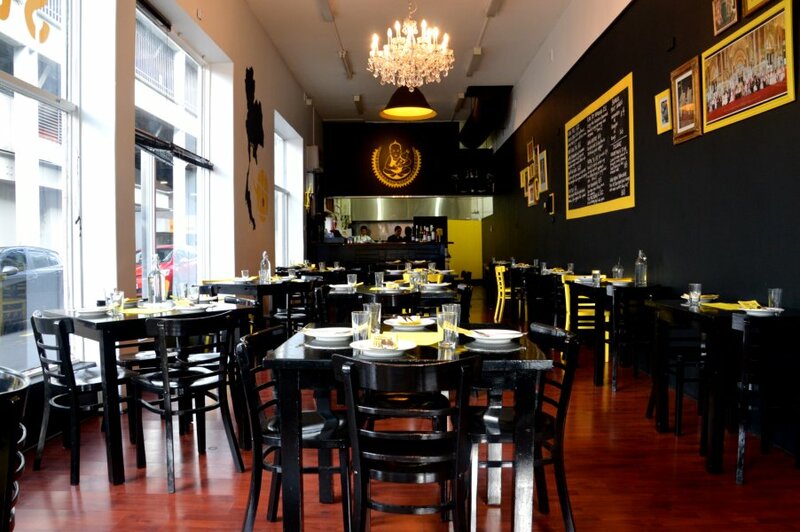 The black and yellow colour scheme features quite prominently in this place. Usually dark colours have an effect of confining a place, but with natural light flowing through it’s dual frontage, that’s not so much of a problem. It’s not a particularly large place seating just over 40 people. For dinner, we decided to order the Pinto Set Menu. For $35 per person, customers get to sample a selection of dishes from the regular menu and specials board which is decided by the chef, although you can specifically pick which dishes you’d like to try. 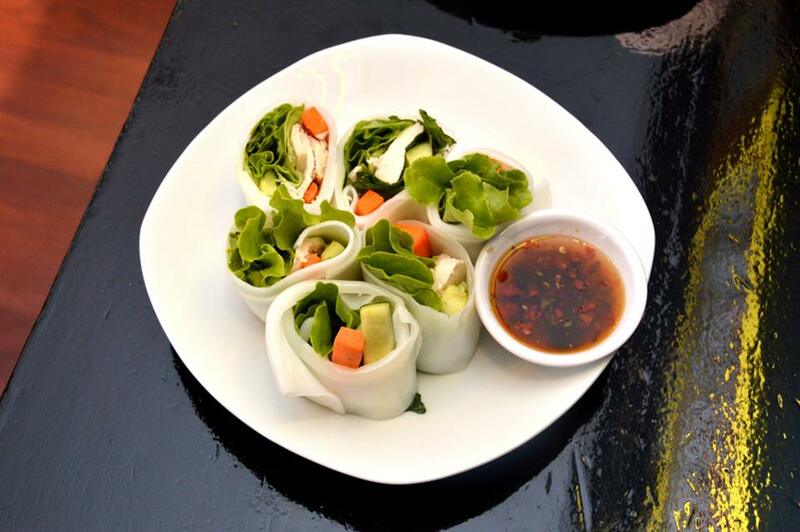 To start off, we had the Lui Suan which are flat noodle rolls stuffed with chicken, shredded carrot, cucumber and coriander which are then dipped into a chilli herb sauce. I thought this dish was like a Thai version of a wrap. 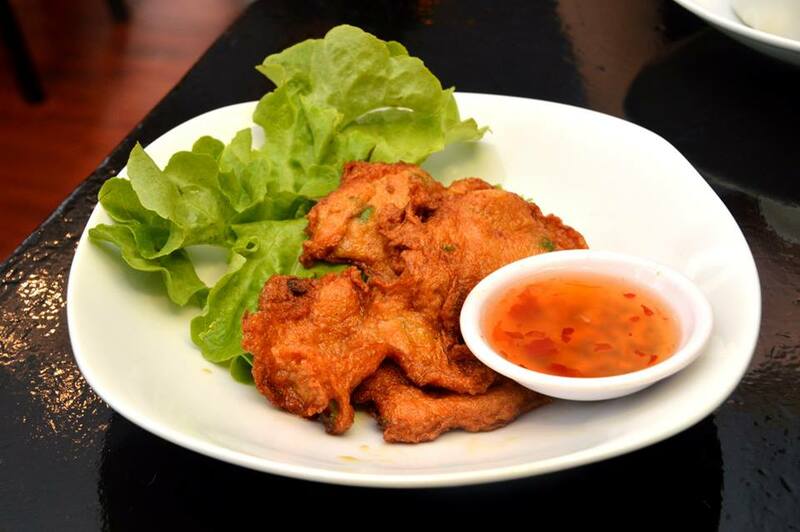 The chilli herb dipping sauce is a must as it provides more depth to an otherwise bland dish. The Tod Mun are fish cakes. The patties are thin, well seasoned and refined. The texture is chewy, but it breaks down in your mouth before it becomes a hindrance. The sweet chilli dipping sauce does well to balance out the slight saltiness of the fish cakes. 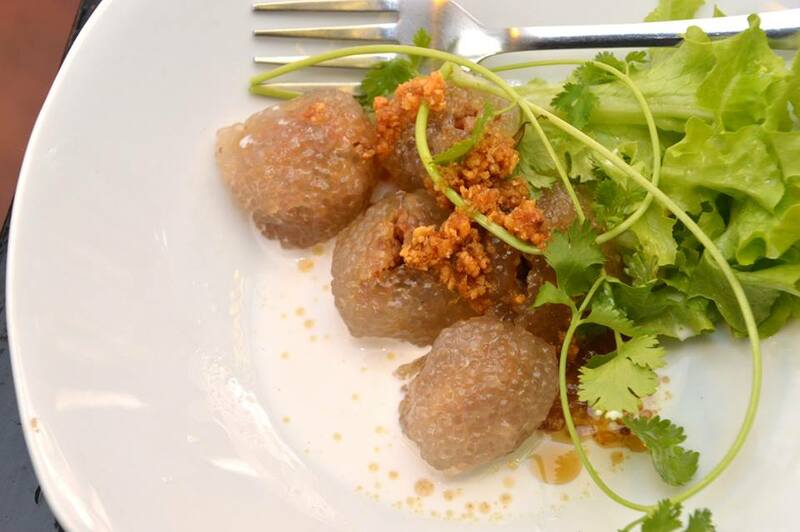 The Sah Koo Sai Moo are sago dumplings filled with pork and peanut and served with a coconut cream sauce. Apparently this dish is not available any other Thai restaurant in Adelaide, and if you took out the pork, it would almost be a dessert. Inside the sticky slimy exterior is some savoury well seasoned minced pork. The dish is subtle in sweetness and is an interesting savoury sweet combination. 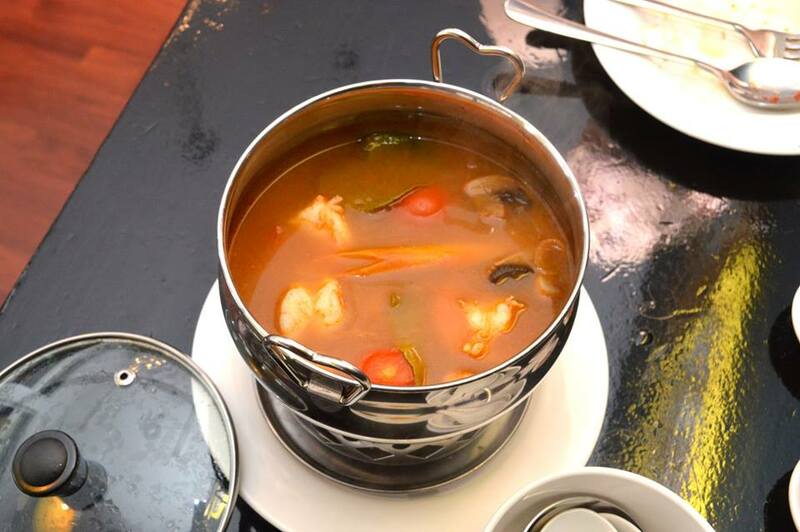 The Tom Yum Soup is a classic hot sour soup with lemongrass, mushroom, tomato, onion and prawn. Some places like to use a Tom Yum paste to prepare their soup, but from a single sip, I could tell this was made from scratch. The soup was beautifully red in colour, had a good level of sourness and a nice after burn. The vegetables were soft and delicate, and the prawns perfectly cooked. 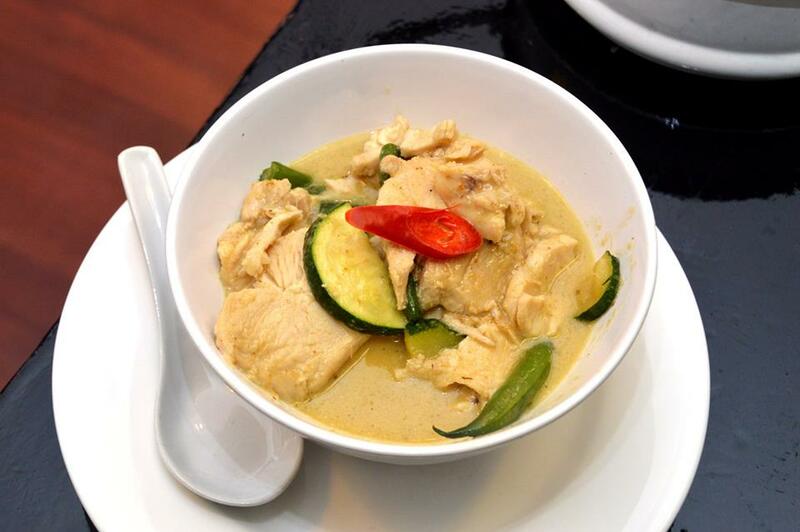 The Keang Keow Wang Ngai is your classic green chicken curry. The chicken was tender and succulent, and the sauce, creamy and well spiced. For me, this was the dish of the night. Best green curry I’ve ever had. 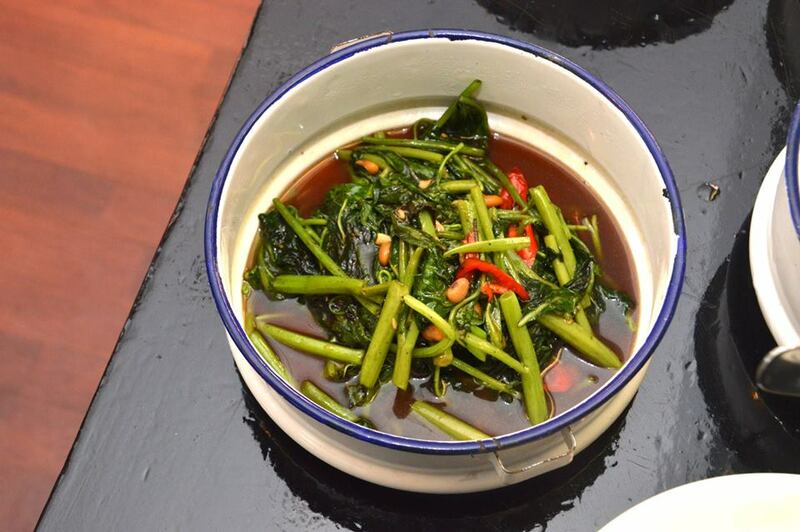 The Pud Pook Boong is stir fried morning glory water spinach with soybean paste, chilli and garlic. The delicious sauce was well absorbed into the spinach, and the dish had good balance and flavour. 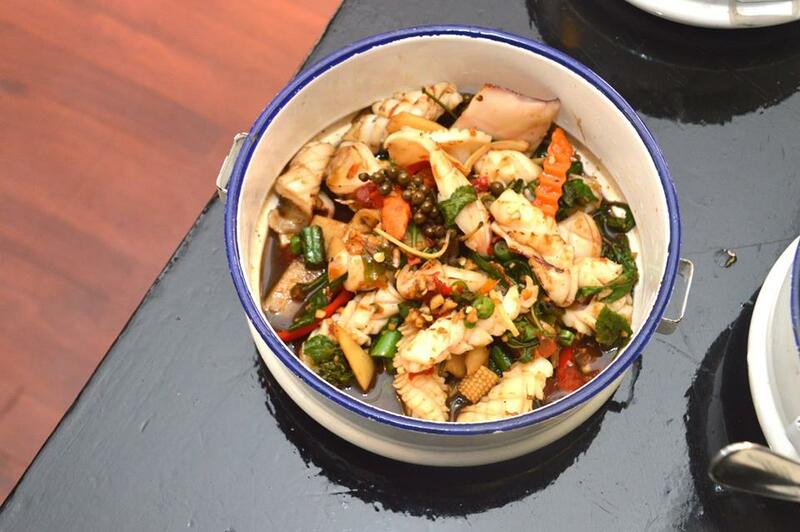 The Muak Pad Cha is stir fried squid with krachai, green peppercorn and prik pao chilli paste. The squid was slightly overcooked in this case. The chilli paste really packs some heat and if you have this dish, you’re in for some exciting times. 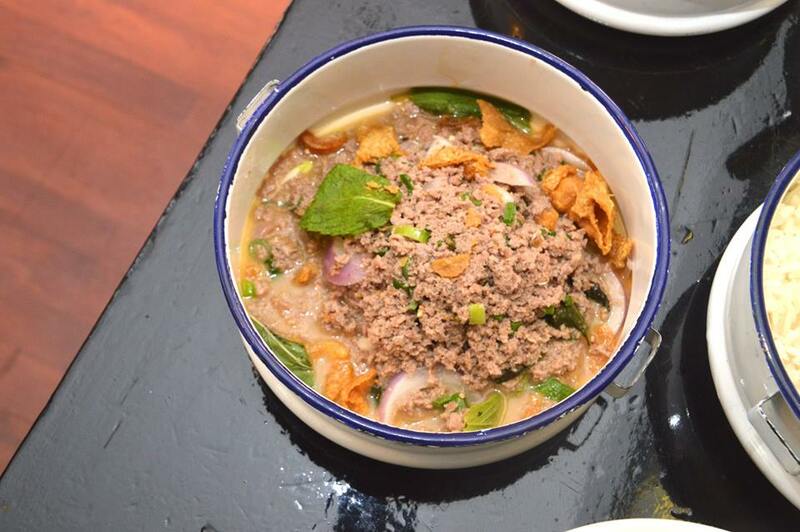 The Pad Man Kua Yao Nua is stir fried beef mince with two types of eggplant, chilli and basil. The beef mince was very well refined with the basil flavour really shining through. Once again, this dish really packed a bit of heat, and we were going through the table water like there was no tomorrow. The staff were friendly and accommodating, and the service was very good. When there was too much glare from the sun, we were allowed to move tables. Drinks arrived promptly and plates were cleared as each dish was finished. The only criticism was the lack of communication between staff members. We specifically wanted to try particular dishes as part of the Pinto Set Menu. The three dishes we requested didn’t come and we had to specifically ask for two of them. With that being said, the Pinto Set Menu represents great value for money as the cost equates to roughly a snack and a main. The atmosphere was vibrant, which is no surprise considering it was Friday night and it’s in a location that has heavy foot traffic, so close to Rundle Mall and Rundle Street. As a whole, just about every dish was well executed. There was some dishes that I preferred over others, but that was a matter of personal preference. While establishments claim to have street food, this is the real deal and is different to your typical Thai restaurant. Their point of difference should see them do very well.